I never thought I had to worry about Heart Disease because it was something that mainly men had. I was seriously wrong! Heart Disease is actually the number 1 cause of death for women in North America. One third of all women die from Heart Disease and it even beats Breast Cancer. A third of all deaths. Wow. My eyes have now been opened and have the book, Saving Women’s Hearts to thank. It was written by two women, one a cardiologist and the other a pharmacist. This book’s goal is to educate women on how to reduce their risk, be proactive in taking care of their heart and knowing which symptoms to look out for. Remember doctors don’t always pick up the symptoms in women and we don’t have the same types of symptoms as men. In fact, they are very different! This book was really easy to read and understand. I was instantly engaged and couldn’t believe that I didn’t know about Heart Disease. Have a been living under a rock? I feel so much more informed now. I like how the book takes into account the conventional medical approach, but also gives information on a more natural approach. There’s things we can do to lower our risk and this book explains how! One chapter that really hit home to me was The Risks to a Woman’s Heart. I have a few risk factors and that made me take pause and question my current lifestyle. For example, high blood pressure, stress and anxiety and not being very physical active are all areas I need to work on. They all increase my risk for Heart Disease. I liked how they explained the tests for the heart including blood tests and what they mean. I have had many of these types of tests and never knew what it was they were looking for! I remember a few years ago wearing a Holter Monitor and knew that it was to monitor my heart rate for 24 hours. I learned more about it and now understand better why my doctor had me wear it. As I read on in the book, I learned about making lifestyle changes to reduce my risk including what foods to eat, supplements to take, and fitness and its benefits. The chapter on the Impact of Stress is a must-read! I am implementing the strategies to managing stress. One of the strategies is “Accept the Things You Can’t Change” and reminded me of one of me of The Serenity Prayer, one of the things I often repeat to myself when things are going bad in my life. As a women, I am grateful for this book and recommend that other women read it as well. Get informed for the sake of your health! 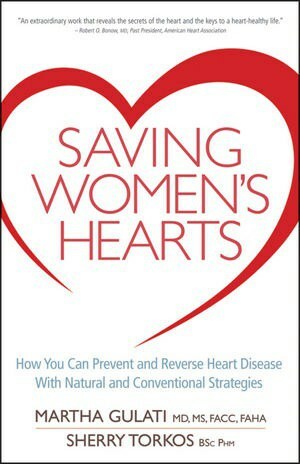 I am participating in the Saving Women’s Hearts program by Mom Central on behalf of Wiley Publishing. I received a copy of the book to review and gift card as a thank you for my participation. The opinions on this blog are my own. I have heart disease and significant family history. I would like to learn ways to reverse it. Member Simply Stacie Blog Frog Community. Everyone could use a realistic perspective of diseases that can seriously affect them. I am celebrating a birthday soon and I am realizing that I’m just not that young anymore. Hope to read this one. Like you, I have recently become aware of my risk factors and probability of getting heart disease, including having high cholesterol, which shocked me. I’d like to win because heart disease is prevalent in my family. I’d like to read this to help my wife – she suffers from chronic illness and could use any hints or tips it might give. I would like read this book because I know I am at risk. My dad died from a massive heart attack and my daughter also has heart disease. I’m sure I would find a lot of useful information in this book. I Follow @simplystacienet on Twitter.